Organising a Christmas event or party? Need a portable Santa’s Grotto? Look no further than our fantastic pop up Santa’s Grotto! Entered through a zipped front door, each sidewall of our Santa’s Grotto shows a different Christmas themed log cabin view – creating the perfect magical setting for photographs. Santa and his elves are sure to feel right at home! Featuring a roaring log fire and Santa’s sack bursting full of toys, our snow-covered Santa’s Grotto is guaranteed to bring smiles and spread a little Christmas cheer during the festive season. What better way to visit Santa than in his own home, cosied up by the fireplace! So whether you’re planning a school Christmas Fair, family event or Christmas-themed market stall, our printed log cabin effect pop up gazebo offers the perfect solution for your Santa’s Grotto! No assembly required! 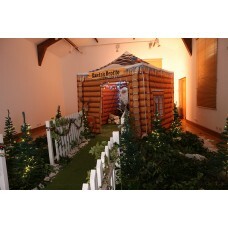 Our Santa’s Grotto is quick and easy to set up and comes fully assembled with no loose parts. This is ideal for Christmas! Introducing our special edition Santa's Grotto Pop Up Gazebo. Get your ..